Arsenal were knocked out by Manchester United in the fourth round of the FA Cup on Friday night. Goals from Alexis Sanchez, Jesse Lingard, and Anthony Martial gave United a 3-1 win over the Gunners at the Emirates Stadium. Aubameyang’s first-half goal wasn’t enough as Unai Emery’s side were completely picked apart by Ole Gunnar Solskjaer‘s Manchester United side. The result means that it’s an eighth consecutive win for Solskjaer who has revitalised and rejuvenated this United side. Arsenal played a similar formation to the one that defeated Chelsea last week. The home side was forced into swapping Hector Bellerin for Ainsley Maitland-Niles following the former’s ACL tear against Chelsea. Petr Cech started in goal replacing Bernd Leno. Alex Iwobi was also offered a start on the left flank to provide width. Against Chelsea, the strike duo of Alexandre Lacazette and Pierre-Emerick Aubameyang operated centrally. On this occasion, Aubameyang started in a wider role on the right flank to compensate for Bellerin’s absence and provide more width. Lucas Torreira and Granit Xhaka started in a double pivot in midfield. Arsenal started the game positively but were dealt a cruel blow as Sokratis Papastathopoulos was forced off with an injury. Ramsey played in the number 10 role behind the pairing of Lacazette and Aubameyang. Aubameyang was tasked with operating on the right flank initially. With Solskjaer settling on his preferred lineup, United were set up in their familiar 4-4-2 diamond midfield. Sergio Romero started in goal behind the centre-back pairing of Viktor Lindelof and Eric Bailly. Both Ander Herrera and Nemanja Matic started in midfield to offer more defensive support. Paul Pogba was tasked with providing creativity and drive from midfield behind the two split forwards in Romelu Lukaku and Sanchez. Lingard played as a false nine with clear defensive duties in blocking Arsenal’s transitional play. Arsenal are not a defensively strong side. Coming into this game, there was an apprehension that United’s pace in attack was a far sterner test than Chelsea’s and that Arsenal would inevitably implode defensively. These fears were well founded as Arsenal were ruthlessly picked apart by United’s counter-attacking approach. In the initial stages of the game, United were happy to let the home side enjoy possession. Arsenal started positively and were quite aggressive themselves. However, the defensive calamity began with Sokratis’ substitution. The Greek defender put in an assured and commanding performance before he was replaced by the error-prone Shkodran Mustafi. United sensed the opportunity to exploit the vulnerability of Laurent Koscielny alongside Mustafi. 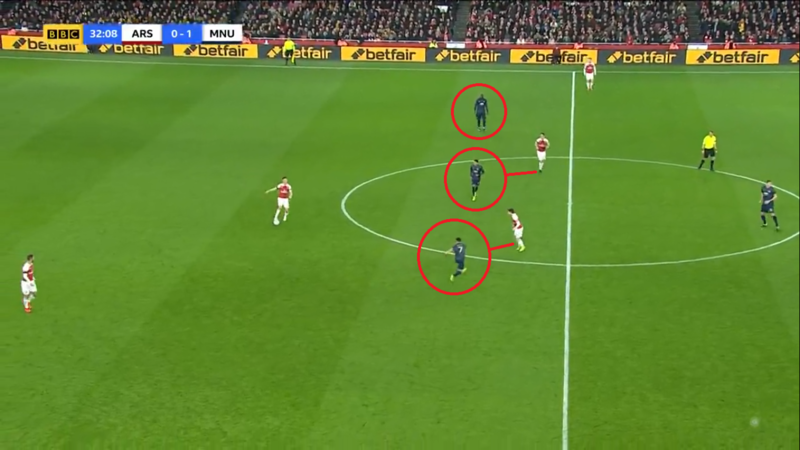 Solskjaer’s tactical setup was perfect to hit Arsenal on the counter. Lingard played as a false nine behind the two split forwards in Sanchez and Lukaku. 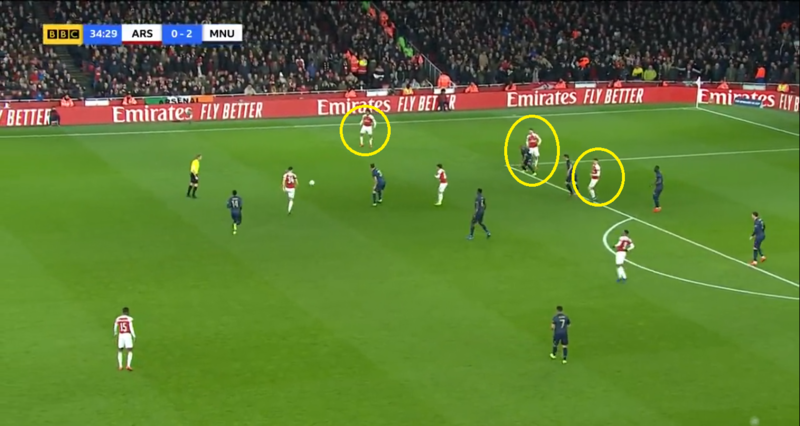 When Arsenal’s full-backs pushed up the pitch, United’s strike duo positioned themselves in the space vacated by these full-backs. Lukaku admitted after the game that they simply waited for the ball to be played over the top in those situations. This was used to devastating effect on United’s right flank. Sead Kolasinac completely neglected his defensive duties as he was intent on bombing forward. With Lukaku running the channel, the Belgian forward was able to use both his strength and pace to set United on counter-attacks time and again. Lukaku runs between Kolasinac and Koscielny. Lingard stifled Arsenal’s midfield transitions playing through the middle. Chaos ensued in the Arsenal defence. As Kolasinac and Maitland-Niles were of no assistance, the home side’s centre-half pairing were faced with 3v2 and even 4v2 situations as United broke in numbers. There was no communication either between Koscielny and Mustafi with regard to the offside trap. United’s third goal: creating a 4v2 situation, United break forward against a helpless, makeshift Arsenal defence. As seen in United’s second goal, Koscielny’s error in utilising the offside trap cost him distance as Lukaku was able to latch onto the pass and calmly pass to Lingard who doubled the visitor’s lead. Lukaku may not have scored but he was undoubtedly United’s best player with two assists. Xhaka and Torreira are caught high up the pitch leaving space for Lingard to run into. Kolasinac is also left in an awkward position, unable to cut the pass to Lukaku. Koscielny’s error in judgment means Lukaku can break free and square the ball to Lingard to score. Koscielny misjudges Lukaku’s position and attempts to play him offside. A worrying trend visible in Arsenal’s attacking patterns is the inability to create chances from central positions and from central midfield. Mesut Ozil’s continued absence has to a certain extent affected the Gunners’ ability to create chances overall. The complete inability to offer anything from midfield however is disruptive. 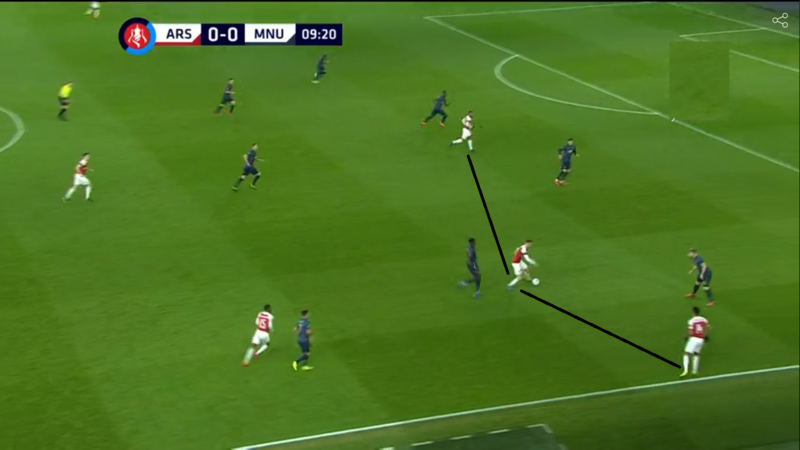 Against United, Arsenal were crippled by this issue as they sought to overload the flanks rather than use the space in midfield. Ramsey is more of an all-action midfielder than a number 10, which meant that Xhaka and Torreira were forced up the pitch to look for passes. 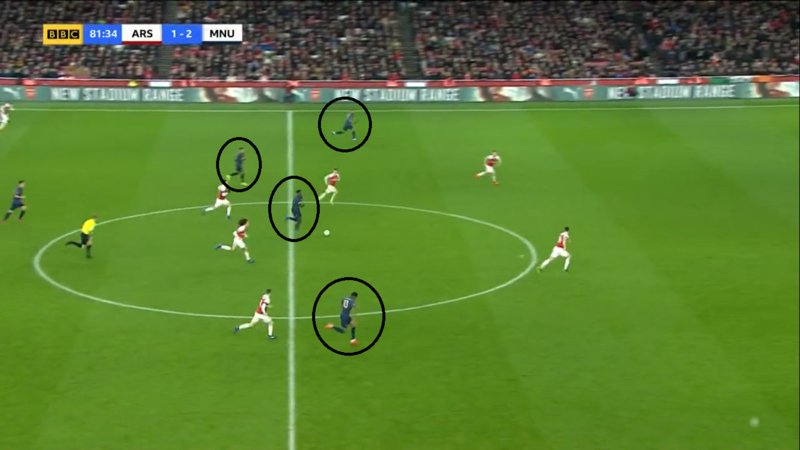 United were prepared for Arsenal’s wide overloads as they had men covering both the winger and wing-back on either flank. 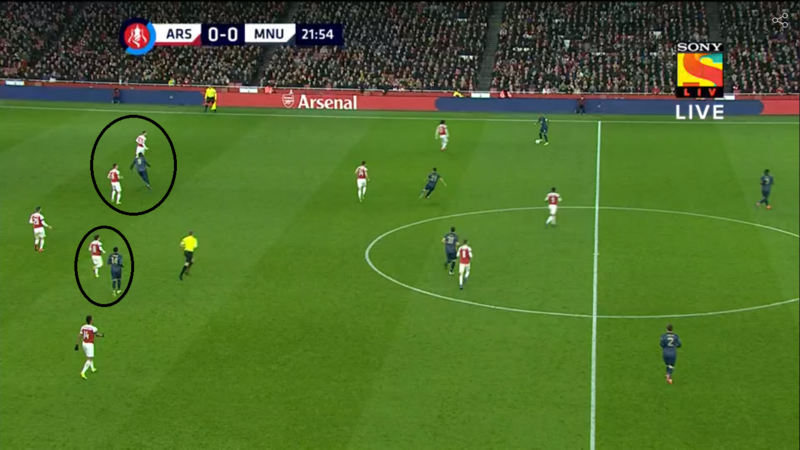 Kolasinac was marked out of the game by Ashley Young and this caused Iwobi to struggle as well. Ramsey tried to make things happen but was in advanced positions too often to find the incisive pass from midfield. When Ozil was brought on, Xhaka played as a centre-back which made the German drop deep to receive the ball, rendering him ineffective. Arsenal were over-reliant on the flanks, especially the left, and were toothless in midfield. Here Iwobi and Kolasinac are unable to engage in their usual overlapping play due to United’s marking. United’s tactics were spot on, starting from their attacking trio. Solskjaer’s forwards ran the channels tirelessly. Lingard’s role was notable as the Englishman used his tenacity and stamina to press Xhaka and Torreira, disrupting Arsenal’s rhythm and transition. As Arsenal went searching for the equalizer, central midfielders in advanced positions left acres of space for Paul Pogba to exploit. The Frenchman started quietly but grew as the game progressed. Matic and Herrera were impressive in midfield, offering more defensive support. The Serb and the Spaniard attempted 12 tackles, made four interceptions, five clearances and three blocks between them, apart from their usually reliable passing. With the home side desperate for a goal and committing everyone forward, Solskjaer went for the kill, bringing on Rashford and Martial. After that, it seemed inevitable that United would kill the game on the counter. Overall, United exploited the same weaknesses in the Arsenal defence that they have year after year, waiting for the home side’s desperation to break in numbers. Manchester United, in the end, were able to dispatch Arsenal quite easily. 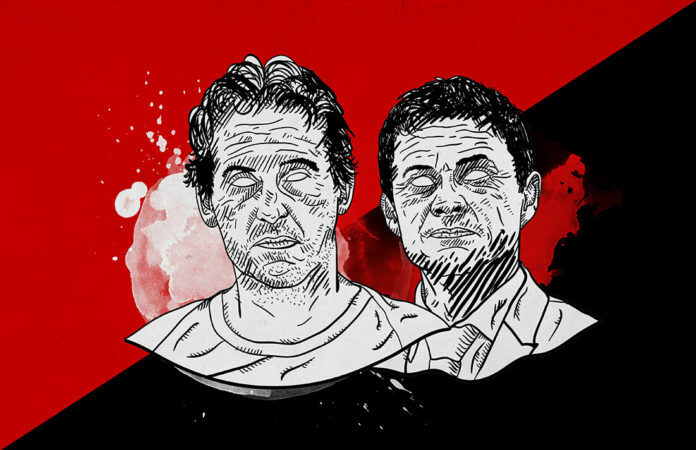 Unai Emery’s side played right into Solskjaer’s hands and the visitors deservedly won and advanced to the quarter-finals of the FA Cup. For Arsenal, the game summarises every issue they’ve faced this season from miserable defending to injury woes. The FA Cup would have been a good trophy to challenge for, but Arsenal’s only hope of silverware this season is now the Europa League. United, on the other hand, are buoyant and look dangerous. Solskjaer has brought attacking football back to his side and you can really tell that the players are enjoying it. The Norwegian seems to have settled on his preferred starting XI and tactical system as well which bodes well for the future. United have a great chance of winning the FA Cup. In this form, they could even surprise a few domestically and in the Champions League.